Santa Maria Novella believes in discretion. Tucked away in a (plush) back street that’s off-off the Fulham Road, the sight of me and my notepad has the sales assistants squirming. “We don’t advertise,” says the chief assistant, slightly scandalised. A steady stream of customers suggested that they probably don’t have to. The wealthy residents of Kensington know all about Santa Maria Novella. It’s essentially their local Bath & Body Works. 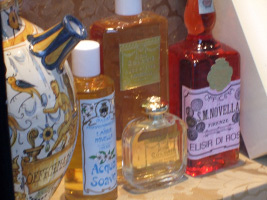 Santa Maria Novella — the mother shop — is the famous Officina Profumo-Farmaceutica in Florence, Italy, one of the world’s oldest pharmacies and the creator of colognes and unguents whose recipes have been handed down for hundreds of years. All of the products are still handmade in Florence. Outside of Italy, the only shops are in Paris and London, although some of the range is available via upmarket retailers. The London shop is small and demure beneath its blue canopy. Inside, it does its best to recreate the mediaeval-laboratory feel of the Florence workshop, with black and white floor tiles and dark wooden display shelves. There’s nothing so arriviste as a checkout till (your receipt is hand-written; the only sign of the 21st century is the hand-held credit card machine, which appears discreetly and is whisked into a back room so you don’t have to watch the vulgar production of the credit receipt). Around the small space, they’ve managed to pack in an amazing number of goodies. On a high shelf are the elixirs — small bottles of thick liquid flavoured with things like rose or chocolate, which are said to be beneficial to health. “You pour a little into a glass of champagne,” says the assistant (well, what else would you do in Kensington?). “Or just have a spoonful on its own,” she adds hastily, probably spotting that I’m not the type to have laid down much champagne. Elsewhere you’ll find silk pouches of pot-pourri, scented candles, soap, bath oil, shampoo and skincare products (including the excellent Pasta Di Mandorle hand-cream). There are tiny books of papier d’Armenie (Carta d’Armenie), soap dishes and men’s shaving accessories. There are also food products — honey, fruit honey, jam, tisanes and sweets. Also beware of the little flacons of estratto triplo (triple extract). Although they’re displayed as if they’re testers, in fact they’re not. 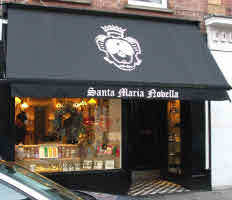 Getting there: Santa Maria Novella, 117 Walton Street, London SW3 2HP. Tel: +44 (0) 207 460 6600. Nearest tube station: South Kensington. Turn left at the top of the steps, left out of the tube station, and walk down Pelham Street to the junction with Fulham Road. Cross at the lights, turn left and immediately right into Draycott Avenue. Walton Street is first on the left, and Santa Maria Novella is a short way down on the right hand side. Nearby: There’s a SpaceNK on the Fulham Road, and a big Joseph store on the corner of Fulham Road and Draycott Avenue. You’ll also pass a Chanel boutique at the top of Pelham Street. And you’re about ten minutes’ walk from Parfums de Nicolaï . Don’t miss: Don’t miss Bibendum in the old Michelin building (near the Fulham Road / Sloane Avenue crossroads).